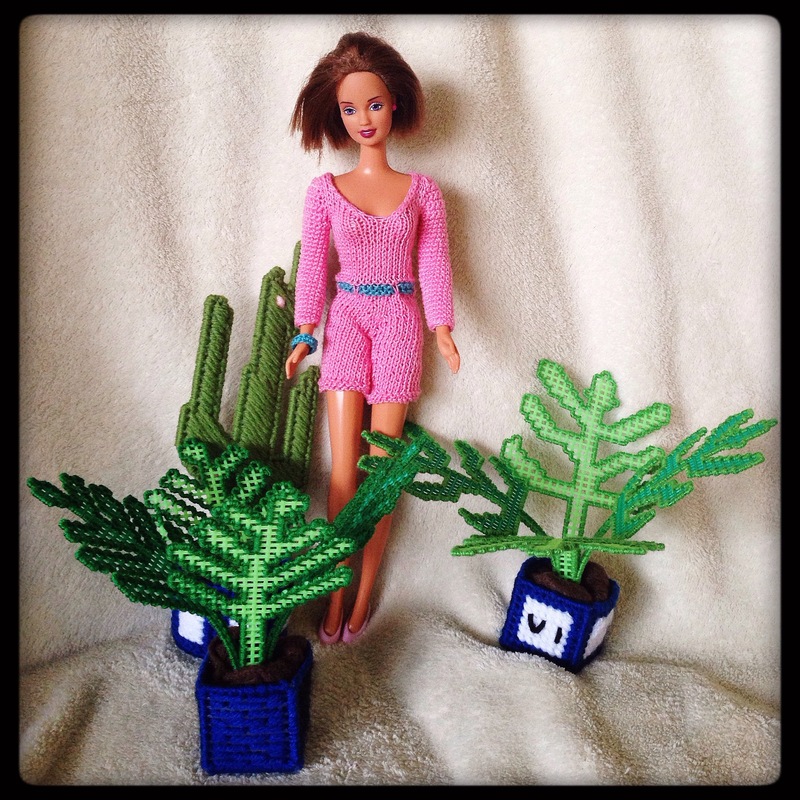 Peri’s Plants | Barbie Who? Ever since deciding to do a Peri doll, I was hard pressed to find a fun accessory to go with her. Cofelia has her Adipose, so I had to find something similarly iconic for Peri. My biggest problem was finding something that is not a piece of clothing. Nothing really stood out, even after watching a few episodes, so I decided to look at her entry on the Doctor Who Wiki to see if that would spark anything. Thankfully it did! I read that she was an American botany student. Botany is all about the study of plants, so I decided to make a few plants to go along with the Peri doll. To create the plants, I searched Pinterest for plastic canvas plant patterns. I am not keen on buying fake plastic plants from craft stores because I am going for a different aesthetic. I like to think of fake plants as being in the uncanny valley of plants – they look kinda real but not quite, so it makes me uneasy. I briefly considered using something dried, but it would be much too fragile for a child to play with. A big part of Barbie Who? is to create something that my daughter can play with, and I do my best to keep that goal present when creating items. Another aspect I considered when looking for plant options was how I wanted to make something myself. After searching Pinterest for inspiration, I was lucky enough to find some plant patterns in plastic canvas. 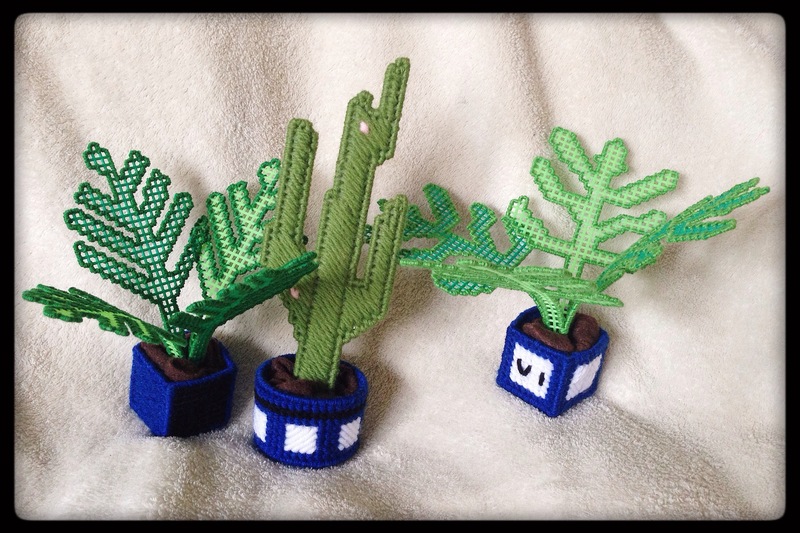 It took several hours of searching to find the free patterns I used to create these plants. The website that hosts the scanned pages is not in English (Spanish or Portuguese, maybe? ), and that made it a challenge to search through their blog posts. Luckily, the scanned pages are in English, so I was able to make them with little trouble. 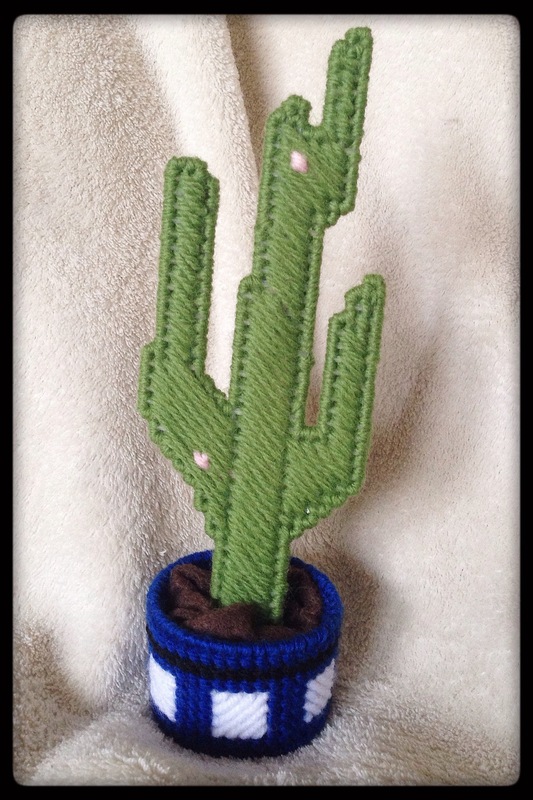 The first pattern I created is a cactus in a round planter. This pattern comes from the Labores de Esther todo para Barbie blog. This blogger has posted many awesome vintage patterns, including this one for a condo and snowmobile set you can create in 7 count plastic canvas. One part of this set is a plastic canvas cactus. I used the pictures template to create my cactus, but I ad-libbed the flowers. 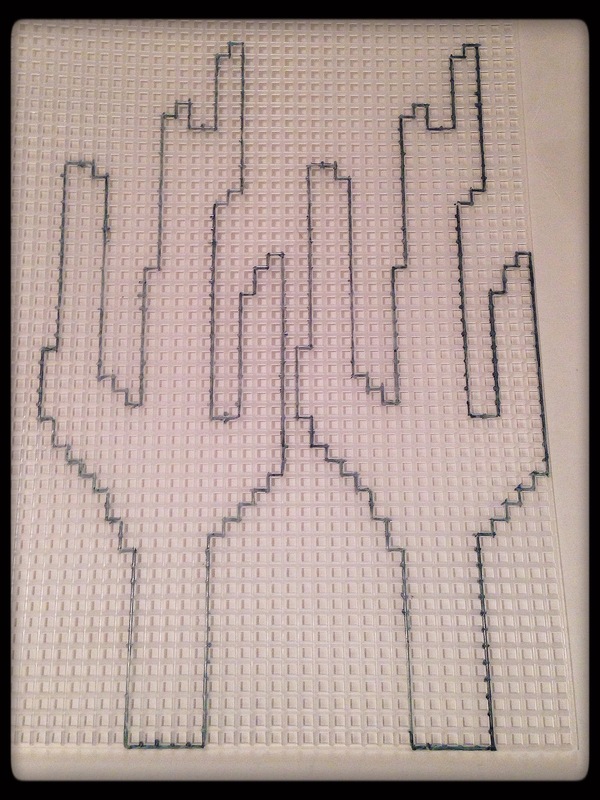 When drawing the outline of the cactus on the plastic canvas, I tried a new tip that I read about on Pinterest. I used a dry erase marker to trace the outline on the plastic before I did any actual cutting. It worked great! I didn’t make any cutting mistakes for either side of the cactus. I remember making mistakes when I was cutting things out of plastic canvas as a child, and I wish I had known this trick back then. I did have to run the canvas under running water to get all of the marker off afterwards (a wet cloth didn’t get the bits in the holes), but it was a small price to pay for the perfect cut. Little things like this are why I love Pinterest. Once they were cut out, I used some leftover worsted weight yarn to fill it in. The green yarn was some wool that I purchased at a thrift store. I used about half of what I had bought on a baby hat, and the rest was in my remnant yarn bag. 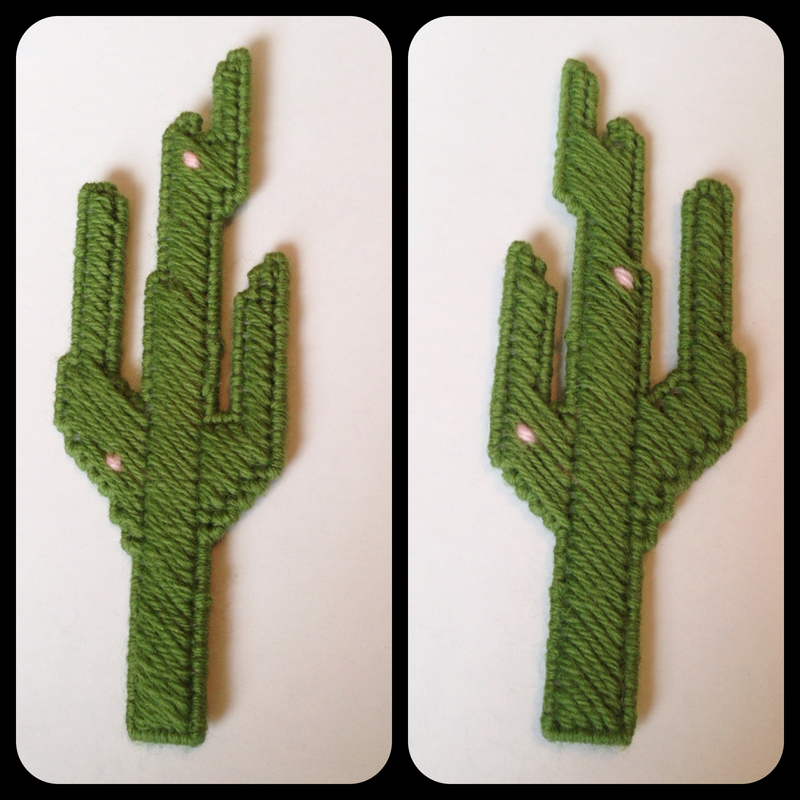 I felt a bit weird using wool for a plastic canvas project, but the only other shade of green I had available was a bright, neon color that would look rather unnatural for a cactus. They’re desert plants, and in my mind they are a darker shade of green. In the end, using the green wool worked out very well on all counts. I added a few pink flowers at the end before whip stitching the two sides together. When I finished, I asked my husband how it looked. He just looked at me like I was crazy and said it looked okay for a weird cactus thing. It was recognizable, so I took that as a win and started on its planter. I created my own design for the planter. I used the same dimensions as the one pictured on the original pattern, but I created my own pattern for the outside of it using Microsoft Excel. I just used simple shapes to create stitches of different lengths, and I played around with it until I found something I liked. 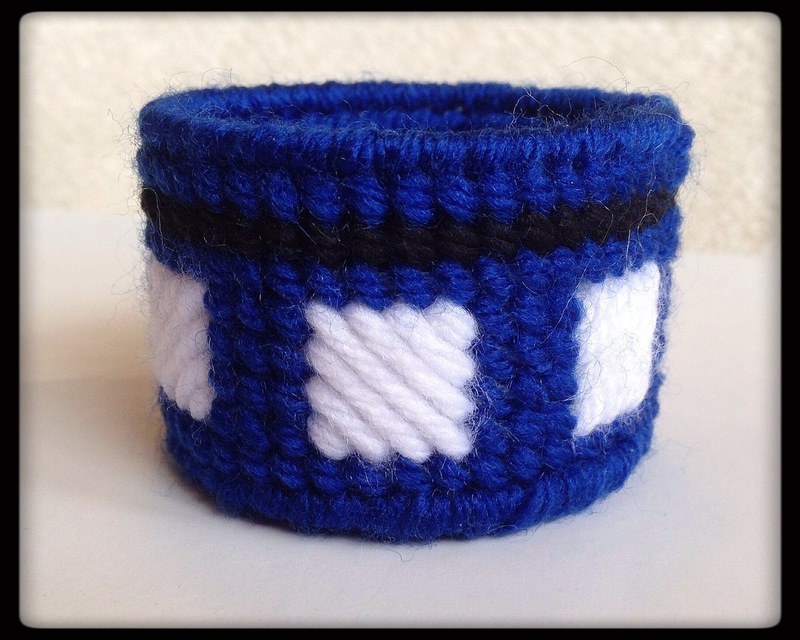 I decided that using the colors of the TARDIS would be the most appropriate thing for this planter, and I tried to make a pattern vaguely reminiscent of a police box. This is what my finished pattern looked like in Excel. From there, I just stitched it onto the plastic canvas. It stitched very quickly; the planter only took a few hours to finish. After finishing the design, I whip stitched the sides together to create the round shape. For the bottom, I used a piece of circular plastic canvas I bought at the hobby shop. I cut it down to the proper length, put a few dummy stitches around the edge to keep it evenly spaced, and stitched everything together. It is a bit hard to see the black stripe in the finished planter, but I don’t mind that too much. It is the price you pay when you work with rich colors. Overall, I am very happy with how the design turned out! It fits the cactus very well. 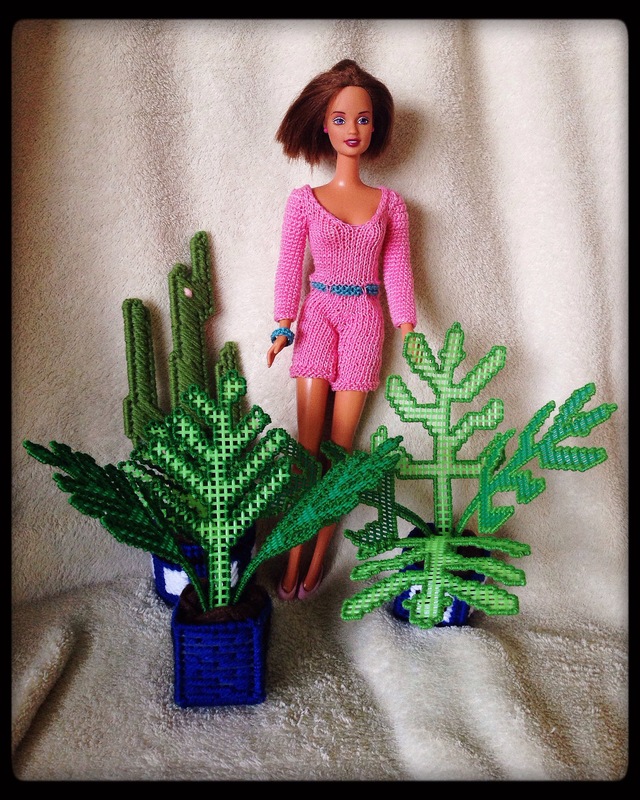 The second and third plants come from the same blog: Labores de Esther todo para Barbie. On this post, she has scans from a patio set that includes two leafy plants. I really fell in love with this pattern, but it did pose more problems than the first. 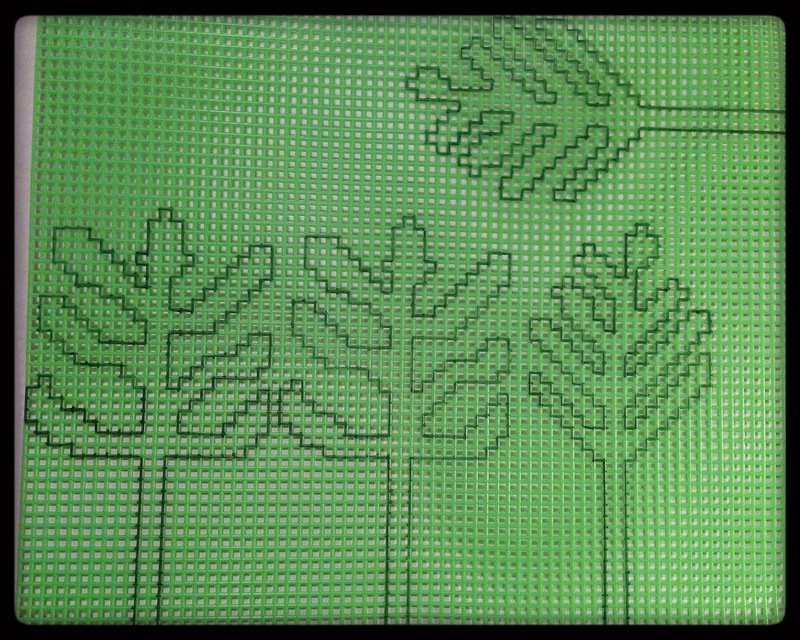 The pattern called for green 10 count plastic canvas. Finding 10 count canvas isn’t hard, but finding 10 count in a green color is nearly impossible. I couldn’t even find the stuff online! It was so, so frustrating. I had two options: I can either use a Sharpie to color some clear plastic canvas the color I need or buy 7 count plastic canvas and call it a giant species. I went with the latter. It looked to be within the proper scale after outlining the patterns, so I roll on with making these giant plants. Cutting these plants out was harder than the cactus. Both were much more intricate, and it had multiple thin areas between the leaves. Luckily, plastic canvas is fairly durable and I was able to get through it without cutting myself or ruining the piece. I also chose to deviate from the pattern by sewing the edges with green crochet thread. I used the deep, emerald green thread I bought at a thrift store a few weeks ago for one plant and a lighter green that I purchased from a thrift store ages ago for the second. I like how the thread edging softens up the edges, but it took about an hour to sew around each leaf. I really prefer the more polished look, so it was worth the extra effort. The crochet thread I used looks like size 10, and it took three to seven stitches in each square of plastic canvas to get good coverage around the edges. For their planters, I decided that I wanted to do something different. The pattern on the website called for another circular planter, but for visual appeal I decided to create my a square planter of my own design. 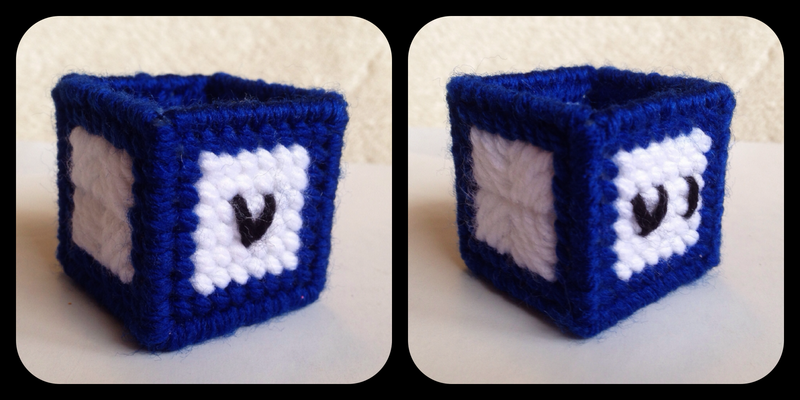 I went with TARDIS colors once again, and these are the patterns I created in Excel for them. In addition to these four sides, I cut out a fifth side for the bottom that I filled in with simple diagonal stitches. I whip stitched the edges together, and added the plants. I know that you can design patterns for plastic canvas in paper or with other software, but I find that this helps me visually see how to stitch the plastic canvas. I am very visual when I am doing these patterns, and sometimes the square-based patterns are hard for me to work with. Each design took about an hour for me to create. Much of that time was researching different stitches and textures; each side of the second square planter has a different texture. The first one also has a small tribute to the two doctors who had Peri as a companion with by using roman numerals. I thought it would be a fun touch to an otherwise simple design. The planters took two to three hours to stitch and assemble. I used worsted weight yarn leftover from a Doctor Who themed commissioned hat I made last year. The worsted weight yarn was much easier to work with than the size 10 crochet thread. It tangled much less than the thread, and it was easier to work in the ends once I had finished using a piece of it. Still, it was interesting to work with different yarns while making these. I now have a better grasp of the limitations different yarns have when I work with plastic canvas in the future. With all three plants, I anchored them in their planters with a square of brown felt. I had originally planned on using rice or a small rock to anchor the plants into the planters, but the felt was able to keep the plants in place without needing the extra weight. I took a standard sheet of felt and quartered it. I put one quarter into each planter, then folded the extra bits in on itself. This left the perfect spot in the middle to place the plants. It was an easy way to simulate dirt without making a giant mess. Win-Win! Overall, this was a fun way for me to work with plastic canvas. It is an interesting medium to work with, and I hope to use more of it as I continue crafting for the blog. The hardest part of using plastic canvas was finding the perfect length of yarn/thread to use when stitching. I found 18″ was a good length for worsted weight yarn. Any longer and the yarn would unwind and be more frayed towards the end, and anything shorter wouldn’t last very long (it is frustrating when you feel like you’re changing yarn every three minutes). The thread was a but hardier; it tended to be hardier than the yarn, but it would tangle more if it was too long. I used 24″ lengths without running into big problems, and I had to change string about four times for each leaf. With these plants, Peri is complete! I will do a quick write-up for her and then choose a new subject over the next few entries. This should be an eventful week! I hope this little project was worth the wait, and I will see you all shortly. Making those plants looked like a lot of work and you did a great job. I’ve seen some books on Amazon with fantastic designs in plastic canvas for Barbie accessories. I must have a go one day if I can source the supplies.